A British company is developing technology to ensure safety when excited performers and heavy machinery share the same space. If live theatre is to compete with film and television, it has to produce visual spectacles to complement the performance of the actors, singers and musicians on stage. Hollywood’s increasing reliance on CGI (computer generated imagery) has upped the ante for stage set designers, who have to work before a live audience, in restricted space and with a constant eye on the safety of the many people working frantically round the set. Many stage props and almost all of the backdrops are lowered onto the stage from the fly tower just behind it. Usually this is done quickly between scenes, but sometimes it is during - and as part of - the actual performance. Either way, safety and reliability are essential. “Until recently, the sets were manually controlled with a technical stage manager watching everything from the wings and giving instructions by radio to the winch operators above.” explains Tony Ingham of Sensor Technology who is helping to introduce safety systems and automation to the theatre industry. Sensor Technology is achieving this using real-time load signals from each winch. The data is monitored by a computer in the control room so that instant action can be taken if any loads move out of tolerance. “We developed the load cells, which we have called LoadSense, a couple of years ago, originally for monitoring cargo nets carried under helicopters.” says Tony. “We were asked to develop one specific capability within the cell and were delighted to do so because we could see that the technology would transfer to many other fields – although I didn’t realise it would get to be a backstage pass to a world of greasepaint and legwarmers! That critical characteristic was robust, industrial-grade wireless communications, something in which Sensor Technology already has a 15year track record from its TorqSense transducer range. In basic terms, each LoadSense has an on-board radio frequency transmitter which sends signals to the control room computer. The transmitter has to be physically robust to cope with the environment it finds itself in and capable of maintaining its signal integrity through the most corrupting of harmonic conditions. LoadSense is proving so sensitive that it can provide a feedback signal to close the control loop on a vector drive controlling the winch. 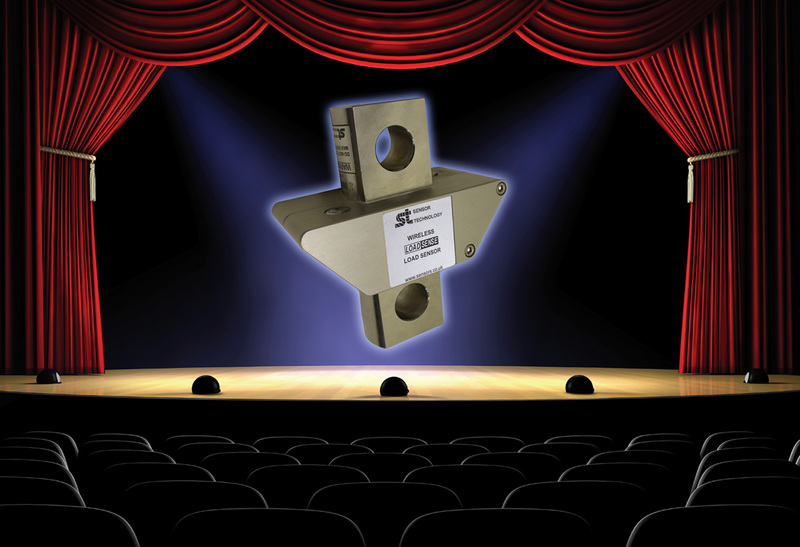 Normally theatre engineers use sensorless vector drives, which offer good dynamic performance without the complications of wiring in a feedback sensor. Sensor Technology is closing the loop which improves system integrity and enhances safety by a significant margin. In fact, theatre engineers probably work in more demanding conditions than manufacturing engineers. Everything has to be right on the night, harmonic corruption is at stratospheric levels, there can be major changes at a moments notice, people run through the ‘machinery’ without a thought for personal safety.